For nearly two decades, Ken Samuelson, BA ’53, has interviewed vets about combat, life and loss. Somewhere around her senior year of high school, Sue Meredith set her hair on fire with a gas stove. Trying to light a cigarette in secret—her parents still didn’t know she’d discovered smoking at summer camp—she leaned too far over the burner, imperiling hairdo, life and the continued habitability of the family home. Fire out, she made a “smart-aleck comment” about how burnt hair smells. Her father, a Navy man and Silver Star recipient, did not care for that comment. Her father, Duncan P. Dixon Jr., earned a Bronze Star for valor and men saved as the commanding officer of the destroyer USS Richard P. Leary on April 6, 1945. Mr. Dixon kept his ship alongside a damaged destroyer near Okinawa, fighting fires, darkness, the enemy and high seas to rescue and take aboard wounded. He also saved that destroyer. Mr. Dixon, stationed at Pearl Harbor on Dec. 7, 1941, would finish his 30-year Navy career with two Bronze Stars and a Legion of Merit to go with that Silver Star. So forgive Ms. Meredith her slip. Her hair had been on fire, and she just didn’t know. Capt. Duncan Dixon was a private man, serious and austere, but certainly not un-warm. Ms. Meredith remembers him as calm and loving and so handsome in his uniform. Adored by his two girls, Sue and her younger sister, Maggie Blum, they still call him “Daddy,” even though they’re in their 70s and he died in 1997. Combat veterans rarely talk about war. It’s more common that they don’t at all, and if they do, it’s to men who, too, have seen war or to psychiatrists for “narrative medicine” if the memories canker and break toxic. Ms. Meredith, a retired middle school math teacher who lives in suburban Atlanta, says her father didn’t have demons or post-traumatic stress disorder. He just didn’t like to answer questions about the war—not from his wife, not from his daughters and not from kids on the occasion of a school project to mark the 50th anniversary of the attack on Pearl Harbor. Even seemingly benign questions about Japanese strategy—“Daddy, why didn’t they blow up the fuel?”—drew short answers. “He said, ‘Boy, you’re worse than a newspaper reporter,’” Ms. Meredith says. On that one, Mr. Dixon eventually relented when his oldest daughter pushed—“‘Because,’” Ms. Meredith remembers he told her, “‘they thought replacing the boats would be much harder than replacing fuel’”—but she didn’t like to push. It’s not that Mr. Dixon was opposed to talking about what happened to him in World War II. He needed to talk to the right person, and that’s how Ken Samuelson, BA ’53, introduced Sue and Maggie to a part of their father they never knew. In 1996, when Sion Harrington started looking for volunteers to interview veterans for an oral history project at the State Archives of North Carolina, he had a feeling that not everyone would turn out to be Edward R. Murrow. Mr. Harrington retired in 2010 after 17 years as the military collections archivist. In that time, he accepted that whiffs were inevitable and that it would be impossible to train interviewers on the history he, a 38-year Army vet (12 years active duty), had spent his life studying. But Mr. Harrington did his best, creating a list of example questions—what branch of service, why did you join, were you drafted, et cetera—to guide the less-initiated while he adopted the resigned philosophy that a bad interview was better than no interview. Today, the Veterans Oral History Program includes more than 1,150 interviews, all stored on an environment-controlled upper floor of a foreboding building in downtown Raleigh. The quality of the interviews, Mr. Harrington says, varies. Some are good, some less so, and some are by Ken Samuelson. “I would love to have had 100 like him out doing interviews,” Mr. Harrington says. Mr. Samuelson volunteered for the archives in 1997, practicing his interviewing on a friend who marched into Germany with Patton’s Third Army. Since then, Mr. Samuelson has become one of the program’s most prolific and proficient contributors, accounting at one point for more than 40 percent of the collection’s interviews and averaging 10 a year. About 90 percent of his, roughly, 100 interviews are with World War II veterans. Mr. Samuelson is an 85-year-old Navy vet with a crisp memory and a sonorous voice. He sings tenor (and sometimes solos) in the church choir and he still plays tennis three days a week, propping up a worn-out shoulder with a daring net game and topspin. He has friends who knew Betty Grable and Leni Riefenstahl, and his wife, Mickey, who also attended GW, is a descendent of James K. Polk’s wife, Sarah Childress Polk. After retiring as the general credit manager for Fieldcrest Cannon, a now-defunct textile manufacturer, Mr. Samuelson was looking for something to do that would feed his lifetime interest in the military. The veterans oral history project fit. Nineteen years later, after seeing an advertising insert in the Eden Daily News, he’s invested more than 1,000 hours and something like 250 cassette tapes for his Marantz PMD201 recorder to preserve the stories of those who lived and those who didn’t. He has sat and seen old men cry as they remembered lost friends and described what they saw in Europe, in Africa, in the charnel jungles of the South Pacific. The 25th man Mr. Samuelson interviewed, Conrad Alberty, survived the Bataan Death March and three years in Japanese captivity, during which he saw the corpses of fellow POWs paved over to hurry the construction of airfields. Mr. Alberty ate bugs for protein and for iron drank water flavored with a rusty nail. Other veterans, men in their 80s and 90s, said it was too soon to talk about what happened to them. Mr. Samuelson never forced it. One of those vets survived the sinking of the USS Indianapolis in the Indian Ocean, where 900 sailors waited almost five days for rescue as they were picked off and slaughtered by sharks. Neuropsychiatrist James Griffith, who specializes in PTSD, says pushing someone who’s had a traumatic experience to talk about it can be re-traumatizing. About half of the veterans Mr. Samuelson interviewed have died now. He’s been to 10 funerals and given one eulogy. That was for Duncan Dixon in 1997. As an 11-year-old in Moline, Ill., Ken Samuelson says, he saw only the glamour of war. It was guns and planes, battle tactics and heroes. It was Captain Midnight and nothing to do with hell and loss. These were the ideas Mr. Samuelson had during the time he spent school nights playing football in the street with the rolled frisbee lid of a large snuff can. In the early 1940s, he says, it was easier to find snuff than real footballs. A lot of people chewed it, even the old ladies. Mr. Samuelson still remembers a few grannies smiling on porch fronts, tobacco gunk in the cracks of their rotted teeth. The football games involved the 10 or so neighborhood kids, including the House brothers. They lived in an old, gray, two-story frame house across the street. There were four of them. “Rough” boys, but good kids. Mr. Samuelson remembers Ray the best. Ray was five or six years older, black-haired and athletic, always happy to play with the younger kids and teach them about sports. War was still guns and planes, battle tactics and heroes. After Ray House, it just stopped being glamorous. Ray’s death cemented inside Mr. Samuelson a respect for war and those who fight it. The bookshelves in his Fearrington Village home—a rustic retirement community 10 miles south of Chapel Hill—favor history over fiction, with sections of C.S. Lewis theology and models of the fighter planes his minor color-blindness kept him from flying. 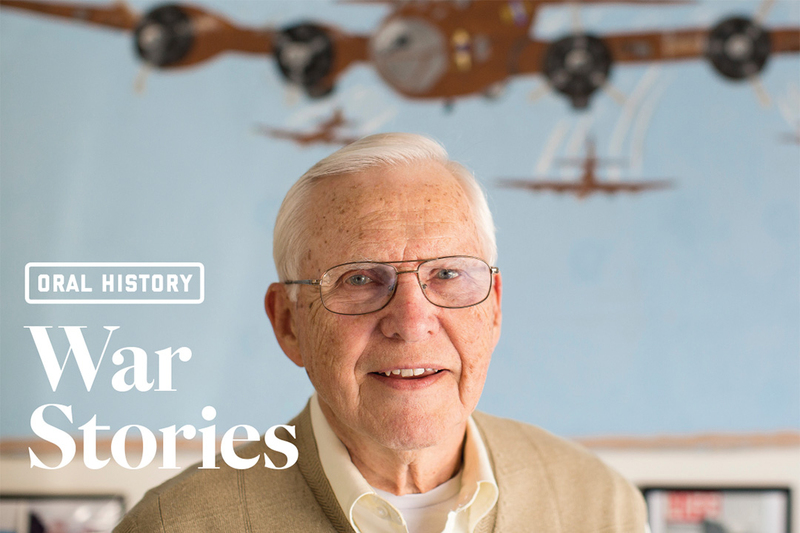 He and his late brother, Fred, BA ’53, had 20/20 vision and wanted to be pilots but the color-blindness left them ineligible. 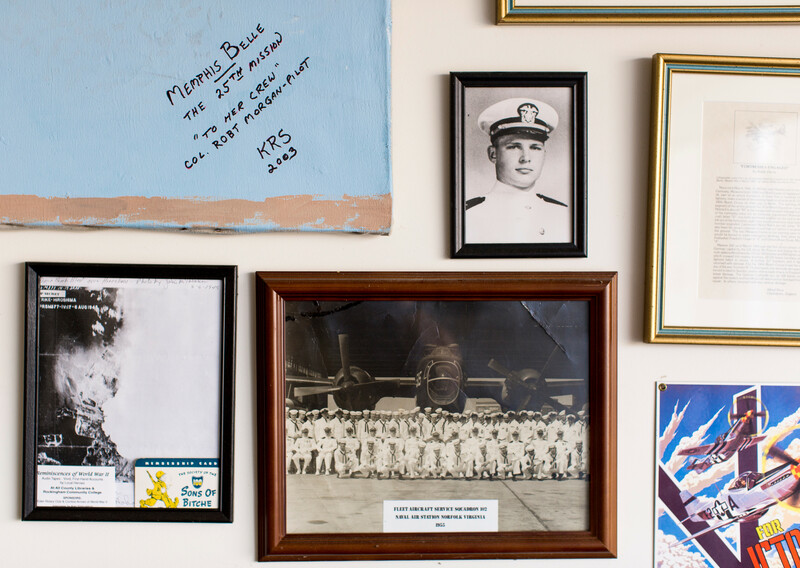 Still, after graduating from GW—where the brothers played football—Ken joined the Navy, going to Officer Candidate School during the final months of the Korean War and then serving as an aviation supply officer. Fred enlisted in the Army in 1947 after graduating from high school and served 18 months before going to GW. Neither brother saw combat. 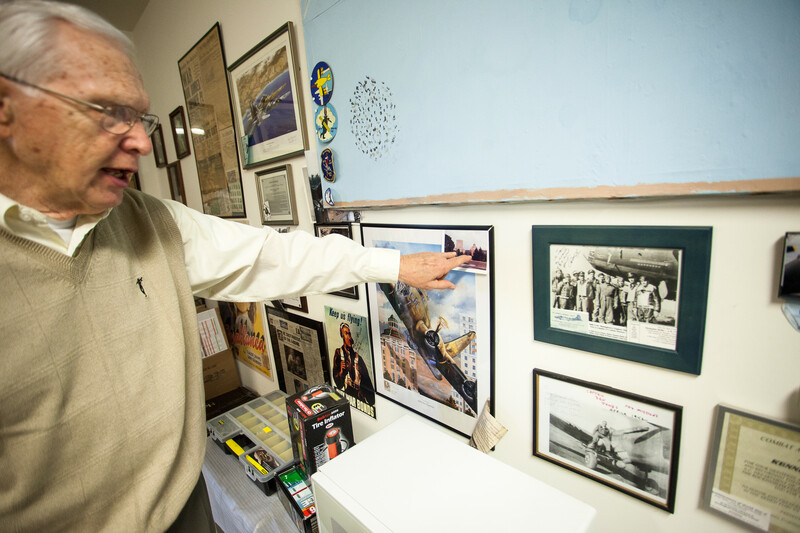 Mr. Samuelson keeps World War II memorabilia most places in the house, in the living room among his dozen or so clocks, in the garage where he painted the Memphis Belle on a far wall. Mr. Samuelson interviewed the famed B-17’s pilot, Bob Morgan, for the State Archives in 1999. He keeps all his interview tapes in a dresser in the guest room. He establishes trust. He listens. He never pushes for more when someone can’t or won’t give it. He affirms service and action and pain. Veterans are altruistic people, says Maria Llorente, a psychiatrist who has worked with more than 1,000 geriatric veterans during a 21-year career at the U.S. Department of Veterans Affairs. Veterans, she says, don’t want to shovel their burdens on other people, not on their friends, not their spouses, not on their children. Sue Meredith and Maggie Blum knew that about their late father. He never wanted to talk about what happened, until Mr. Samuelson asked. “I’m sure it was Ken,” Ms. Blum says.